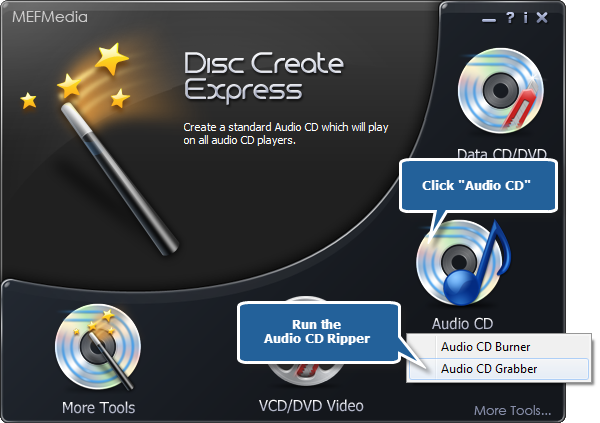 Disc Create Express comes with an Audio CD Ripper tool to copy the tracks of your beloved CD albums. You can extract digital audio tracks directly from audio CDs to most popular audio formats in perfect digital quality. It is an easy way to backup your music and enjoy them with portable players without carrying a bag of discs. This post will show you the details of how to rip Audio CD with Disc Create Express. To rip Audio CD, launch Disc Create Express first. 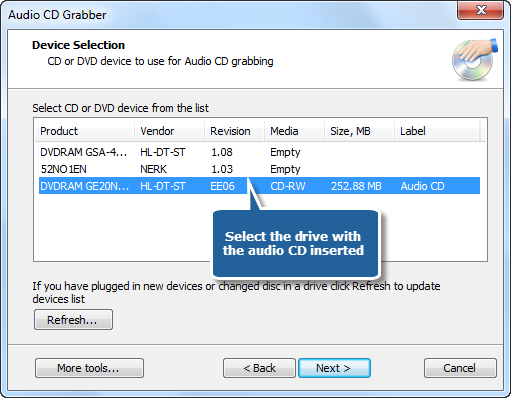 Insert an audio CD to the CD drive, click the “Audio CD” and choose “Audio CD Grabber” to run the ripper wizard. The ripper scans your system for the available devices. Choose one of the usable ripping drives from the list (the system will select it by default if there is only one). 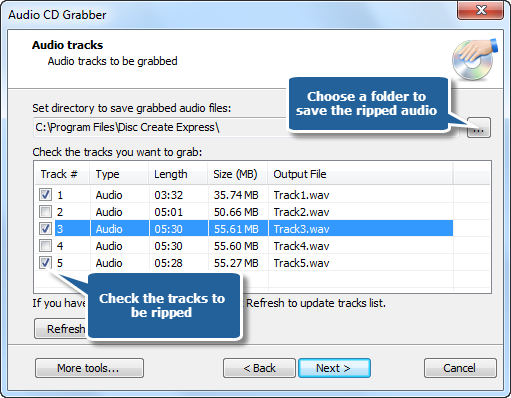 Choose an output folder used for saving ripped audio files and check the listed audio tracks to be ripped. Choose one of the compression types from the available templates to fulfill your needs. Click “Next” to start ripping. Please be patient. The ripping will be completely finished after the process bar reaches 100% and the disc drive will eject.